At the IM household, the alcohol tends to flow freely. Starting back in 2007, when we were both in graduate school, my wife and I began a tradition: every Friday evening, we would unwind after dinner by splitting a bottle of red wine, talking and enjoying each other’s company by candlelight. These evenings would usually unfold over 2-3 hours and were almost always accompanied by music, games of backgammon, fine cheese (or homemade bread), and conversation that solved all the world’s problems. These “wine nights” were therapeutic for us, and we happily kept up this weekly tradition through most of 2009, occasionally substituting craft beer for the red wine. Fast-forward to July 2009. I had just completed my doctorate and landed my first post-graduate job, and we packed a Budget truck and moved to a city in east-Texas. To be frank, I hated my new job and we both hated living in that city. It was a city of extremes: extreme income disparity, extreme politics, and extreme religious fervor. I usually walked to work, and people would sometimes yell at me from their monster trucks to either get a haircut or to get a job, the latter of which I found rather humorous since I always wore a coat and tie. To make matters worse, this city of over 100,000 people was the county seat of a dry county. It was against the law to buy alcohol, except in restaurants. So, you could not buy beer, wine, or liquor in a grocery store or gas station, but you could go to a restaurant and pay through the nose for any kind of drink that you want. Think about that for a second – you can’t buy a six-pack of beer to drink at home, but you can go out on the town and guzzle all the spirits you want. And they wondered why their DUI rate was so high…. Adam was but human — this explains it all. He did not want the apple for the apple’s sake, he wanted it only because it was forbidden. The mistake was in not forbidding the serpent; then he would have eaten the serpent. Forbidding the purchase of alcohol only made us want it more. So we did the only logical thing we could do: got ourselves a Costco membership and occasionally made the 90-mile drive to Dallas to stock up on beer, wine, and other delicacies. Saturday “wine nights” soon joined the ranks of Friday. Wednesday followed soon thereafter. Before long, we found that we were imbibing on more days of the week than we were abstaining. We always found a reason to uncork: I had a rough day at work. This city stresses me out. I finished grading papers! Whatever. Glasses would clink and laughter would soon fill the air thereafter. At this point, I feel the need to clarify that we never get drunk. Not even close. If a single unit of alcohol is a 12-ounce bottle of beer or a 5-ounce glass of wine, then a typical evening involves my wife drinking 1-2 units and me drinking 2-3 units. Splitting a single 750 ml bottle of wine works out perfectly for us. We drink only enough to each enjoy a light buzz and to feel peace and goodwill toward all mankind. Alcohol is meant to be sipped over the course of an evening with pleasant company. We avoid hard liquor for that reason – the thought of taking a “shot” is repulsive and defeats the entire purpose of drinking in my book. We stick to good beer and wine only. To each his own…. We moved to San Antonio in 2011 so that I could take a new job. I love where I work now, and we’re much happier with where we live, but our increased alcohol consumption continued. It doesn’t help that San Antonio is such a festive, boozy city. People have spontaneous fun here, and I appreciate that. It was sorely lacking in east-Texas. Up through mid-2013 we have continued our trend of drinking alcohol 4-5 days a week, mostly because we enjoy it now and it’s become a habit. Hey, it’s after five o’clock. Let’s have some beer on the back porch and wait for the sun to set. These are still precious and valued moments for us. If we thoroughly enjoy our near-constant “wine nights” and we never get drunk/hung over, then why do we need a reformation? Great question. The problem is one of the Hedonic Treadmill. Simply put, humans have a tendency to always return to a stable level of happiness despite increased positive or negative stimuli. Let’s say that you earn $40,000 a year. If next year you get a raise to $75,000 a year, you will briefly feel happier, but you will soon adapt to a new normal and won’t be any happier than you were earning the lower salary. The same could be said of other pleasures, such as spa trips, shopping sprees, and wine nights. Basically, drinking alcohol nearly every night means that it has lost its special place as our weekly unwinding tradition. It has become the new normal, and though we still enjoy it, it brings us no more happiness than it did when we imbibed only once a week. Furthermore, I’ve also found that my tolerance has steadily risen – drinking three bottles of beer or half a bottle of wine no longer gives me much of a buzz, which means that I actually get less enjoyment out of wine nights than I did back in 2007. To compensate, I would need to permanently start drinking four units of alcohol instead of 2-3, which would definitely make me feel aglow. However, the Hedonic Treadmill and ever-rising alcohol tolerance would soon rear their heads again, eventually pushing that up to five drinks per day, then six, and so on. I’m not willing to go down that path, both for financial and health reasons. Did I mention that drinking nearly every day is expensive? We drink at home, buying nearly all of our alcohol at Costco, but still, it adds up. We’ve been buying at least a 24-pack of beer each month plus several bottles of wine. I’m tired of spending that much for a diminishing level of happiness. One unit of alcohol is hereby defined as one 12-ounce bottle of beer or one 5-ounce glass of wine. Rule #1 – You have a weekly quota. Drinks that we purchase may not exceed the following self-determined number of units consumed per week: 3 for myself, 2 for my wife. Rule #2 – The above weekly units may all be consumed in one sitting or spread out as you see fit. Rule #3 – Do not purchase alcoholic beverages at restaurants or bars. A drink bought or offered by someone else does not count toward your quota – if we visit friends and they offer us a glass of wine, we won’t turn it down. Additional drinks may be consumed on major holidays, though they should still adhere to the self-determined number of units per session. After all, I think it’s constitutionally enshrined that one must drink on Thanksgiving. 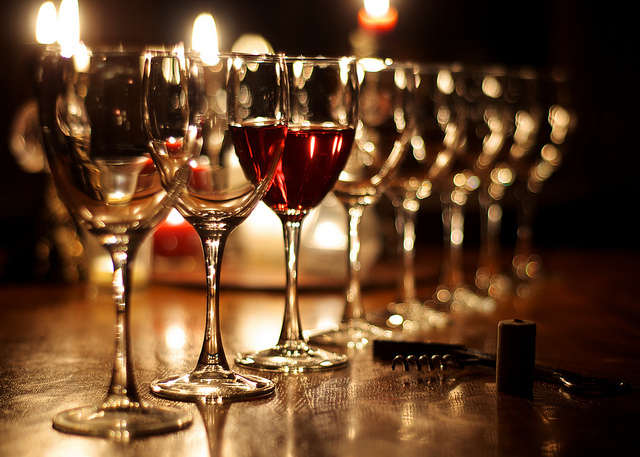 Additional drinks may be consumed on special occasions, such as birthdays and anniversaries. Vacations don’t count, though you should still adhere to the quota numbers for each drinking session. These guidelines are a starting point, and we may revise them in the future. My wife and I have each other to keep accountable, though I don’t think we’ll have a problem with cheating. I just spent nine days abstaining from all alcohol, just to prove that I could. I had nary a craving the whole time, so I feel good about it. If you can’t do this, then please seek help. The long and short of it is that we want alcohol to once again become a weekly treat and not a daily expectation. Setting these guidelines and making them public will help make that happen. We may grumble a bit at first, but after a month or two, the Hedonic Treadmill will ensure that our happiness levels rise back to normal, and we’ll soon delight in our weekly wine nights, solving all the world’s problems as we once did.